Initiation of flowering onto around 63 cm. - Final Height onto around 98 cm. very little amount; into an average length as well as slightly above average strongness. ...looks and grow more like a Sativa. ...are well suited for a ScroG (Screen of Green). ...respond well to the pruning of the main stem. The crop of this strain is slightly below average. The ratio of buds to leaves is slightly below average. The dried buds are rather fluffy. The weed is not to strong and not to soft. 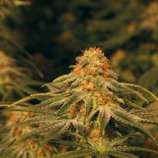 Single Plant-Profiles about this strain was uploaded by: HarzQuartz and smokebandit2000. This Strain-Profile is an average out of all Plant-Profiles who was uploaded by our users. If you also have grown this strain before, please use our upload-form to expand and update this data! Its fast and easy, you only have to check some boxes, but it will help us a lot to fill up our database and standardize the strain-descriptions. And later we can integrate some options to search or sort this data, too!